Our monthly meetings are held at the Main Branch of the Vigo County Public Library, unless otherwise noted on the calendar. The time is from 7 - 9 PM with a half-hour social time (and food!) beginning at 6:30 PM. Children are always welcome at meetings and a babysitter is available for $1 per child per hour. Meetings are made up of speakers, discussions or just simple social time. This is the perfect time to catch up on what is going on with club members, see friends, or learn something new about parenting or our community. 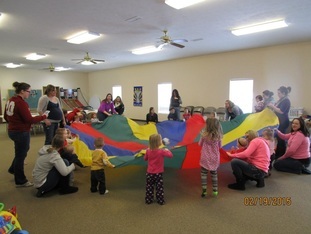 Playgroups are open to all members and their children. Playgroups are usually in someone's home or at a designated area, like a playground. The calendar will indicate where and when playgroups are. Playgroups give kids a chance to play together while giving moms a chance to socialize. 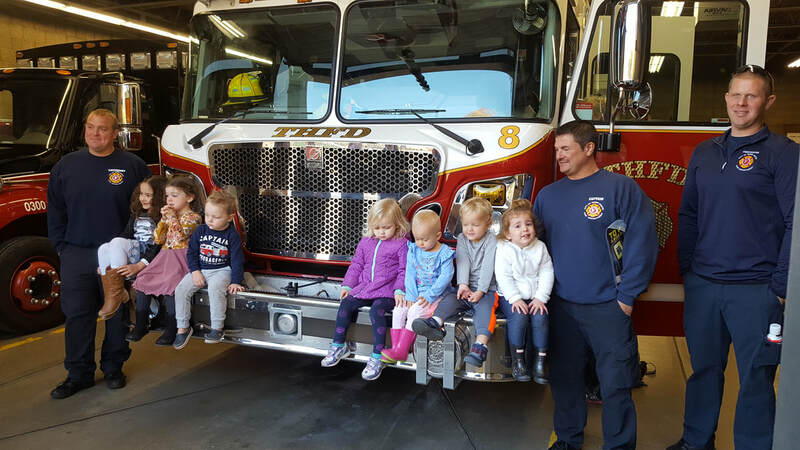 In addition to regular playgroups for all children there are sometimes: age-specific playgroups (story time for babies, squirt gun fight for older kids, etc. ), pool or park playgroups, and special "crafty" playgroups where we have made tie-dye clothes, painted pumpkins, or done other assorted crafts. Another fun activity we do in MACC is taking field trips/tours to different area businesses and attractions. Field trips usually include an informational lesson for the children or a different type of learning experience. Past field trips have been taken to St. Mary of the Woods, the Terre Haute Regional Airport, Horse Shoe Equine Rescue, Inland Aquatics, WTWO, Fresh Thyme and many other places around the Wabash Valley. Mom's Night Out (MNO), Mom's Day Out (MDO), or Mom's Morning Out (MMO). For Mom's Nights Out, we meet sometime in the evening and we go out to eat, play games, go to the movies and/or other fun activities. For Mom's Days Out, we meet sometime during the day to go shopping, do scrapbooking/other hobbies, or something else fun. For Mom's Mornings Out, we typically meet for breakfast, coffee, or just to visit. Because these events are intended for moms to get some time to themselves, we ask that children not attend - but if you have a nursing infant feel free to bring them. The book club meets once a month (unless otherwise noted on the calendar) to discuss a book that the club members have chosen. Feel free to bring a drink or snack. We also have many other events throughout the year, including but not limited to: visiting retirement and rehabilitation centers for costume parades or caroling, Parent's Nights Out (date nights, dance lessons, etc. ), new member gatherings, Spring Fling, Fall Fun Day, Christmas party, and ornament exchange. We participate in various community events as well, including Indiana State University's Blue and White Homecoming Parade, Family Learning Day at the Vigo County Public Library, and the March of Dimes. During the warm months, we post a Story Walk in Dobbs Park where you can read a book while walking on a wooded trail. The story is changed monthly and is available for all of the community to enjoy. If you don't see your favorite activity or interest group here, just ask someone! We're always open to new ideas!